Living on fixed incomes, American seniors are one of the most at-risk segments of homeowners regarding foreclosures. This group of retirement-aged homeowners is increasingly energy savvy. They are choosing to make investments in their homes now, to save on energy costs, avoid rate hikes, and take advantage of government incentives. Many of them are choosing to become solar seniors. The largest percentage of the United States population is aged 65, and over, of that group, 64 percent have a positive view of solar energy. This according to a report by Pike Research. They also found that 58 percent of Americans aged 55-69 are interested in installing solar panels out of concern for the environment as well as to decrease their energy costs. This growing number of solar seniors will likely have a broad and profound effect on the transition in the U.S., to more clean, renewable energy. As far as energy savings, one can expect to save between 20 and 40 percent in annual energy costs with solar panels installation. Of course, this doesn’t consider the costs involved in remodeling. However, financial returns aren’t the only incentive for going solar. When a senior installs solar, they are also improving the environment by reducing greenhouse gas emissions and reducing their use of non-sustainable energy sources. The most common image that comes to mind when one thinks of solar energy for the home is solar panels. Solar panels are formed by solar cells. These cells work by converting sunlight directly into electricity. This is not unlike the cells that are used to power calculators or watches. Made of semiconductor materials like those used in a computer chip, they collect sunlight. When sunlight is absorbed, the solar energy displaces electrons from their atoms. This allows the electrons to travel through the cells, producing electricity. The process of converting photons or sunlight to electricity is called photovoltaic (PV) effect. Solar cells are typically combined into panels that hold around 40 cells. These panels are then mounted in groups called PV arrays. These flat-plate panels can be mounted at a fixed angle, or they can be mounted on tracking devices that follow the sun. This allows the panels to capture sunlight over the full course of the day. Several PV arrays can provide enough power for an average household. The sun can be used to heat the water used in homes and swimming pools. Home water heating systems that use solar have two parts: a storage tank and a solar collector. The most common type of collector is a flat-plate. Like PV panels, it is mounted on the roof. It consists of a flat, rectangular box with a cover and is mounted to face the sun for most of the day. A system of tubes run through the box and carry the water to an absorber plate. As heat builds up, the water passing through the tubes is heated. A larger, well-insulated tank holds the hot water until it is used. Swimming pool solar heating systems are similar. However, the pool's pump is used to propel the water through the collector, and the water then is stored in the pool. Solar powered motion-sensing lights are ideal for seniors who are concerned with keeping their home secure from those who lurk in shadows especially when the power goes out. Solar power security lights are more and more common because they are more powerful than they were previously. An attic fan is an important part of cooling a house in warmer weather. A solar powered attic fan can push the hot air out of the attic space using sun-generated electricity. It keeps the house cooler and lightens the load on the AC unit. One square foot vented space for each 300 square feet of attic space is a good rule of thumb. Keep in mind, a solar attic fan costs nothing to operate, while an electric fan can be costly during the summer. Decrease the electricity usage through solar installation. Reduce energy costs without users experiencing an increase in monthly expenses. Provide incentives, both full and partial, for low-income participants to implement solar systems. To make available, the power and efficiency of solar, to all homeowners regardless of their means or income. To decrease expenses of solar ownership with a higher incentive than is offered by traditional means. Develop more sustainable energy solutions which are environmentally and economically friendly. To qualify for subsidies provided by the various states seniors should live in the home they are upgrading. They should also have a documented income lower than 80 percent of the state’s median income. They would also need to be getting their home’s energy from mostly non-sustainable sources, including through the local electricity or gas company. To find a solar initiative in their state, seniors should check with the Database of State Incentives for Renewables & Efficiency to learn about the various incentive programs available for them. Even without state incentives, there are cost savings from decreased utility electricity payments as well as financing, and deferred cost options, that prompt more and more senior homeowners to consider converting to solar power. - By Jess Walter, Freelance Writer. “Solar Seniors Help Realize California, U.S. Renewable Energy Goals,” TriplePundit. “How Solar Can Save You $$$ in Retirement” PowerScout. “Why go solar? Homeowners say: 'To save money',” CNBC. “Photovoltaic (Solar Electric),” Solar Energy Industries Association. “HEATING WATER WITH THE SUN” VA SUN. “Solar Swimming Pool Heaters” Office of Energy Efficiency & Renewable Energy. 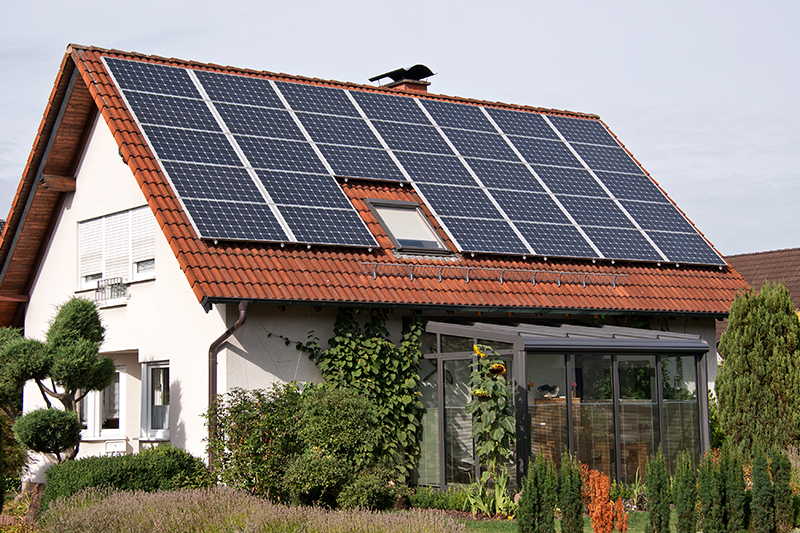 “Beyond Bulky Panels: Attractive Options in Solar Power” HGTV. “Database of State Incentives for Renewables & Efficiency” DSIRE.